While the human species is unquestionably a member of the Primate group, the identity of the next closest group to primates within the entire class of living mammals has been hotly debated. Now, new molecular and genomic data gathered by a team including Webb Miller, a professor of biology and computer science and engineering at the Penn State University, has shown that the colugos -- nicknamed the flying lemurs -- is the closest group to the primates. A paper announcing the results will be published in the journal Science on 2 November, 2007. The team was led by William J. Murphy, associate professor in the Department of Veterinary Integrative Biosciences at Texas A & M University. Another classic example of new research corroborating evolution. From the thorough, multiple approaches William J. Murphy and his team used, there can be little doubt that Colugos or "Flying Lemurs" are a missing link between Primates and the other mammals. 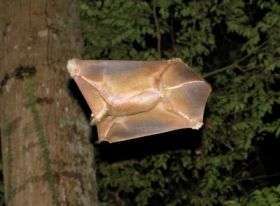 The Philippine Flying Lemur, Cynocephalus volans or the Sunda Flying Lemur, Galeopterus variegatus are the bridge between mammals and Primates. Maybe with gene splicing, could we not create "Flying Humans"? :lol: Spiderman, beware!